In this lesson, students explore the different types of memory. I suggest starting with this activity adapted from a resource courtesy of Philip Upstone – “Main Memory - Kinaesthetic Activity”. You can find the original here: (http://community.computingatschool.org.uk/resources/938). In this activity, students move around the room simulating the transfer of data between various storage locations such as RAM, Cache memory, Secondary Storage and Virtual memory. Tip: For a bit of fun, you could introduce the activity using a Voki (http://www.voki.com). A Voki is a free service that allows you to create personalised speaking avatars and use them on your blog, website, and in email messages. 2. 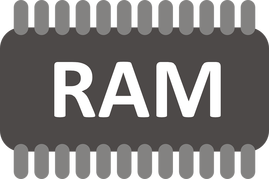 An explanation of why having higher amounts of RAM can speed up your system. (Above) For a bit of fun, use a Voki to introduce the main task.